Jean Kazez: Where Have I Been? We have a winner! 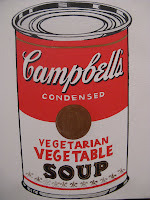 The soup can is a detail from an Andy Warhol painting at the Museum of Modern Art in New York and tthe pig is at the University of Arkansas in Fayetteville. I thought for sure one of the very nice and interesting Arkansas students I met would be the lucky winner, but the winner is in fact....(drumroll)...Jonathan in NY, who will indeed be receiving a copy of my book just as soon as I have one in my hands. More guessing games and book give-aways sometime soon. We are CLOSE to having a winner. Dangit, I can't figure out where the pig is. I know, it isn't fair at all. The pig favors people who live in a certain place (that I just visited). That's famous soup, but not a famous pig. Not a famous pig? I beg to differ. Woo pig, sooie!